In January I participated in the Blue-Ribbon Wrap Knit-Along for Larissa's book. This was one of the first knit-alongs I joined in on and really enjoyed it. I really like the finished product as well. 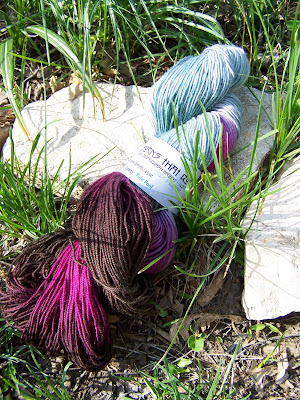 But there was another benefit - I won a skein of Socks-that-Rock Yarn dyed especially for Larissa and her book. The yarn came last week. Thank you so much Larissa for your generosity in sharing this yarn. It is so beautiful and I have already cast on for a new pair of socks (no pictures as it has done nothing but rain all weekend - 3.33"). But here is a picture of the yarn in the skein taken when the sun was still shining. The colorway is called Tidepool.